What will be the spawn/base area. Two of the larger mountains. A few pics from an external map viewer. This is my third project in my custom terrain series, and by far the most difficult. 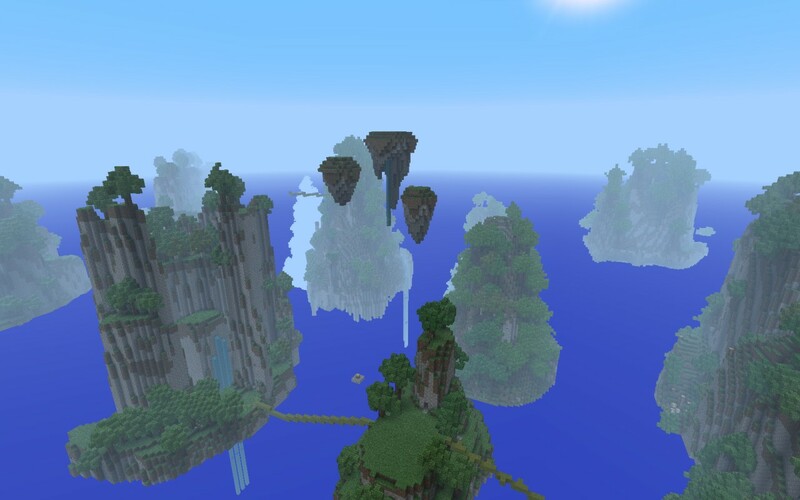 The idea for this project was suggested by crazyazey12 in the comment section of my Canyons and Caves map. 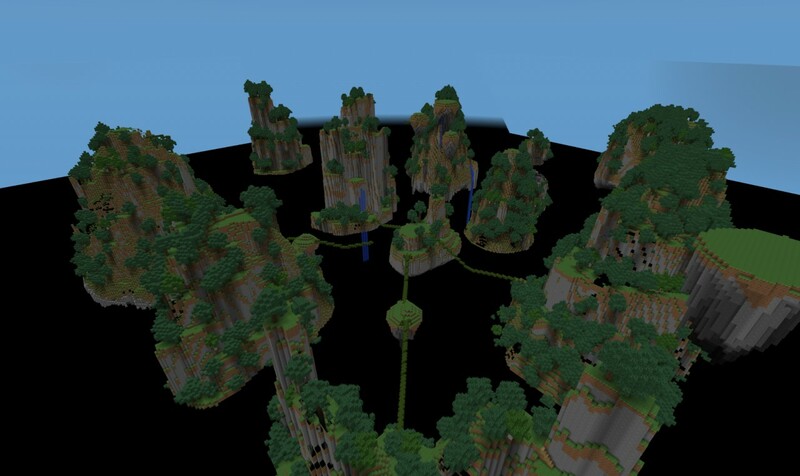 To put this project together I relied on the heavy use of Worldpainter, MCEdit and SPC. 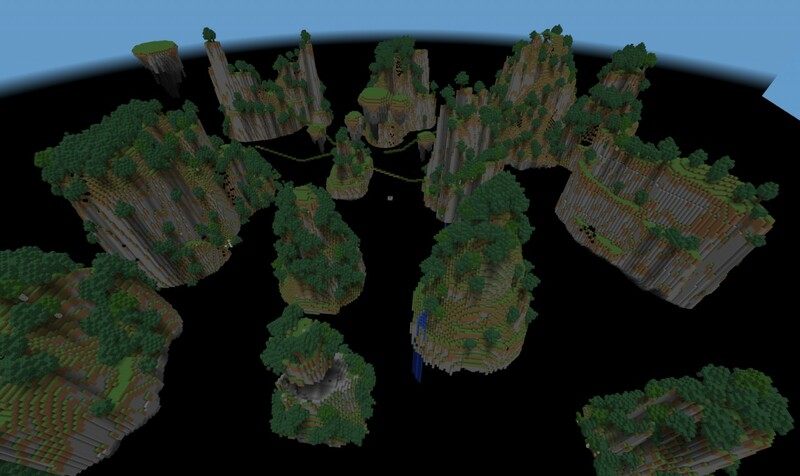 Each large mountain was individually hand made in Worldpainter first, then pulled out with MCEdit and brought in the actual project for the final detailing and layout. Getting a consistent descent looking mountain maybe took around 25-30 tries alone, after that it must of taken at least another 25 tries to get all the sizes and different styles down. I pretty much have all the large mountains created and imported in at this point. Some have almost all the detailing done while others I haven't even started on. I still might move or add in a few smaller ones depending on the space. 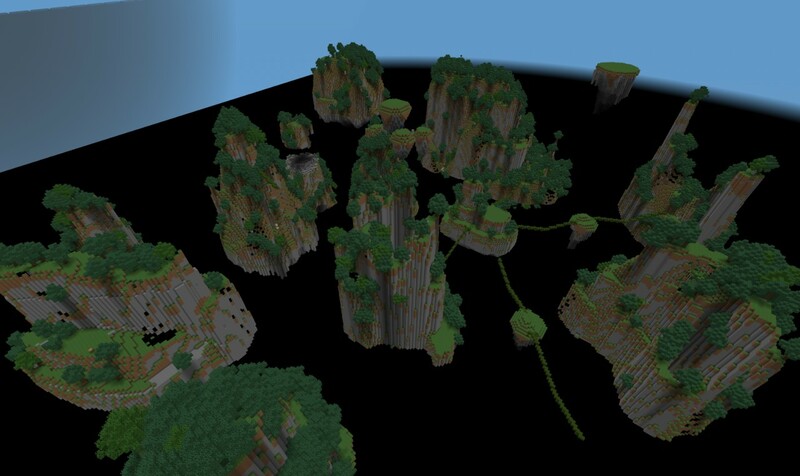 I have also started messing with a basic vine type bridge system and completed two mountains so they are accessible on every single open level or tier. I added a world save and schematic, only a few mountains are connected right now tho so you will need to build a bridge or have a fly mod to get to the others. Make final decision on the large mountains layout. Add in any smaller floating island type items. Create a bridge system to the rest of the mountains. Make the rest of the mountains accessible on all levels. Finish details/underside on large mountains. Create a few small outpost areas. Need help installing this project? See my Projects Guide for full instructions and other helpful info. The approx terrain size is 384 x 384. -Added in spawn house from other project. -Finished a few bridge sections. -Added some more lighting and signs. 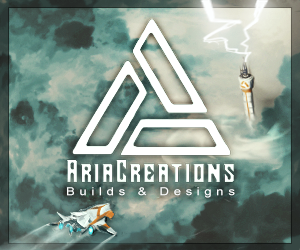 -Uploaded world save and schematic. How did you make And Epic! 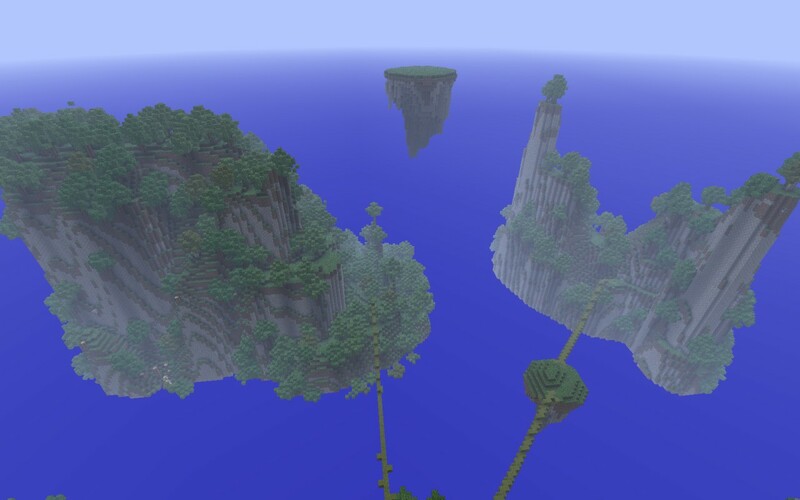 hey I'm gonna use this for a custom map.. Is that ok? I'm just gonna give it to my friends ,not public or anything, and I'll give you credit. just wondering. can i play the custom map? sure, If I can get it up. Might not be up till summer (in america) because I've got a lot of other projects going. I like your map but may I now what version it is? You still making this or no? what program do you use to make al your awesome maps??? Worldpainter, along with a few other tools, I have them listed in the description. Dude, can i use this for a custom map? This is by far the more creatice map I have seen you make. Awesome work. I love it. That's fine with me, I just ask that you give me credit for the terrain portion of it. Hey can i use this in a multiplayer server with your permission? Yea, that's ok with me. jusht a suggeshtion, try making a home base island! The spawn island with all the bridges connected to it does have a small house you start off in now, I just didn't update any of the pictures to show it, it should be in the download files tho. This is looking really good! Is the map program you're using that super long draw distance one? Thank you. The name of the external viewer is Eihort. It is really nice for long distance views and screenshots with no fog. 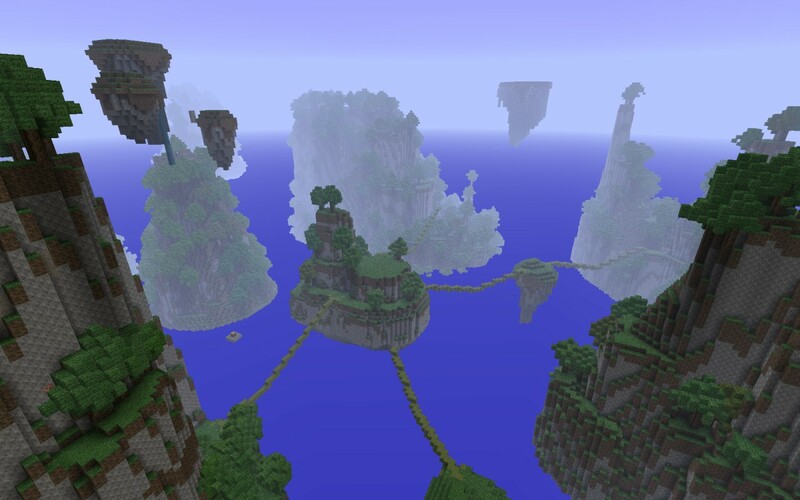 It also runs pretty fast to while moving around, considering the render distance. World save? This is amazing! Thats epic, i love the flat one! Cant wait for download! yeah i know right! weres the freeky flying things?